Image courtesy of Gotham Greens. A new bill introduced in New York City Council Thursday addresses the need for an urban agriculture plan that doesn’t fall through the cracks of the city’s zoning and building regulations, the Wall Street Journal reports. The bill, introduced by Councilman Rafael Espinal and Brooklyn Borough President Eric Adams and assigned to the Land Use Committee, also raises the possibility of an office of urban agriculture. 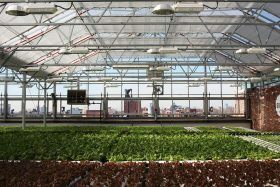 If a New York City farm bill seems surprising, you may also be surprised to know that NYC has the country’s largest urban agriculture system, including community gardens, rooftop farms and greenhouses.